MaltaPost continues its series of 'Malta Buses -The End of An Era' with the issue of six stamps illustrating some of the Island's most iconic buses which are no longer in operation. The stamps are from reproductions of original artworks by Maltese artist Cedric Galea Pirotta. "Valletta -St Julians Route " - This is one of four double deck buses built by Thornycroft , a United Kingdom based vehicle manufacturer. This together with a single deck version, and another which was fitted with a lorry body to carry passengers formed part of the first bus fleet to operate in Malta. The operation started in 1903, running between Valletta and Sliema, but is not believed to have lasted very long, and the vehicles were certainly no longer in use by 1911. "Victoria Hire Service" - This is believed to be the first bus to have operated in Gozo, and was built based on a Ford chassis. Released in around 1925, it was withdrawn and replaced in 1934. "Magirus-Deutz O3500" - One of Malta's best known buses of this kind was "Maggie", a Magirus-Deutz O3500 which was fitted with locally built bodywork by Michael Debono. 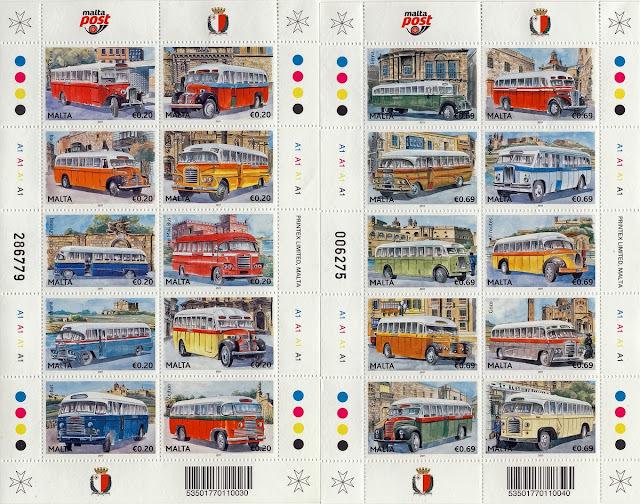 It was withdrawn in 2003, but unlike many such buses was retained for future preservation and restoration, and is now in the care of Heritage Malta. "Malta Police Bus" - When the British Royal Air Forces withdrew from Malta in the 1970s, the Maltese Police Force obtained four short Thames ET6 buses with bodywork built in Malta by Frank Aquilina in the 1950s. Thames, a British based chassis builder formed part of the Ford group. The MP54's were later replaced during the 1980s. "Royal Armed Forces Bus" - The British Armed Forces made use of a number of buses over the years to transport personnel around the island. During the 1950s and 1960s one such bus was the Bedford SB, built with very basic bodywork. Bedford, also a British based chassis builder formed part of Vauxhall Motors, itself part of General Motors. The Bedford bus depicted here shows what a Royal Navy bus would have looked like. Once no longer required by the Armed Forces, these Bedford SB buses were sold off locally. The bodies were scrapped and new locally built bodies were fitted. A number of these survived and were in daily use until July 2011. "Airport Bus" - These unusual looking coaches with bodywork by Park Royal of England, were built on Commer chassis and were released in the late 1940s. The raised -up rear section allowed space for the stowage of luggage underneath the seating area. These vehicles operated shuttles between Malta's airport in Luqa and hotels in Valletta for overnighting passengers. Initially operated by British Overseas Airways Corporation, in 1949 these Commers passed to the Malta Airways Company, and then in 1954 to the newly formed Malta Aviation Services. Both buses survived until the 1960s, with one remaining in use as late as 1969. An earlier set of stamps was produced some while ago as shown below, which provide a splendid 'at-a-glance' reminder of those interesting days of transportation on the island. The burning issue though, is whether any of the more modern vehicles will ever be immortalised in such a way, especially the Mercedes-Benz articulated bendibuses.